You Might Be a Redneck if… the Game does not require that you be from the South, but for you to have a tolerance for mildly off-color humor. It will likely delight Jeff Foxworthy fans. Don’t let the beer can ring on top of the game box throw you off; your game isn’t used, it’s supposed to be there. And the hastily drawn artwork that adorns the package will seem quite fitting after you play through this venture. Lay out the colorfully scribbled game board and pick your redneck. Distribute the groups of Recliners, Hound Dogs, Flyswatters, Jerky, TVs and Satellite Dishes (all unique) to their respective headquarters. Now check your necks. The player with the biggest Redneck goes first (if you’re a natural redhead and pale like me, you will never go first). Play continues in turns. On yours, have another contender read you a Jeff Foxworthy joke and its three potential punchlines. 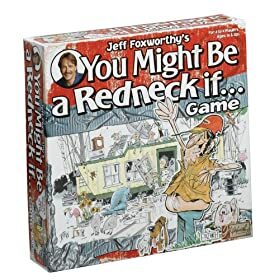 The jokes are all – you guessed it – “You Might Be a Redneck if…” It’s your duty to pick the one that Mr. Foxworthy actually said (distinguished on the card by what other color but red).How much you get to truck it is not even on every card. You will get to move a little regardless of whether you got the joke right or not (thank goodness). You can hop from tire to tire in any direction you like on the board as long as you stay in a straight line. You’ll want to make pit stops at the various junk headquarters to pick up one Recliner, Hound Dog, Flyswatter, Jerky, TV, and Satellite Dish each (Mother-in-Law’s house has both the Hound Dogs and Satellite Dishes, but you can only select one per turn). Store this junk in your equally junky personal trailer. If you end up on a spot that has a sign on it, the game wants you to do what it reads for the duration of play (“Talk with a Thick Accent” or “Go Barefoot”, for example). Dumb Luck is the other special spot where you must draw a card and flip a coin to determine who will do the silly instruction listed. Throughout the game of You Might Be A Redneck, you may lose some of your yard sale loot, so you had better get it back if you plan on winning. The first player to proudly amass all six items and find their way back to their Home Sweet Home – all the while solving Jeff Foxworthy jokes – is the winner. This game is unique. The quirkiness of it all makes it appealing. On the other hand, it’s also kind of stupid. You’ll wonder what Jeff Foxworthy was thinking when it comes to some of the punchlines of these jokes (especially when some of the other possibilities sound more logical). You either need to be a lighthearted “Redneck” or a person who is attracted to unusual games to enjoy You Might Be A Redneck . It may offend those who are loud and proud about the South.